This week at The Outsiders London sees the opening of 'Structural Integrity', a new body of work by American artist Logan Hicks. 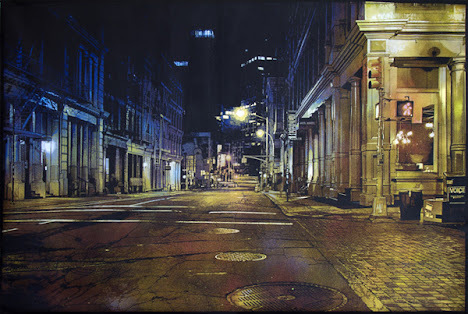 Recognised throughout the art world as a pioneer in stencil art, Logan creates photorealistic paintings of urban landscapes in meticulous detail from layers upon layers of painstakingly cut stencils. Logan's focus on city architecture comes from the idea that hidden between city walls and alleyways are millions of stories and secrets from all the people who have lived and walked these areas before: "I see all these buildings and I wonder what stories they have to tell...my work reflects on the events that have come before me". Structural Integrity will showcase a series of cityscape paintings as well as photographs taken from Logan's travels over the past 5 years, documenting the underworld of cities around America and Europe.